There is no doubt that I like companies that tend to be able to control their own destiny. I also like companies that are operating in oligopolistic arena, but yet they act like it is open competition. These kind of companies will tend to do well as they are competitive. Some of the petrol retailing companies are such in nature. As I have mentioned before in previous articles over here and here, Petron may have some advantage due to its competition that exists. 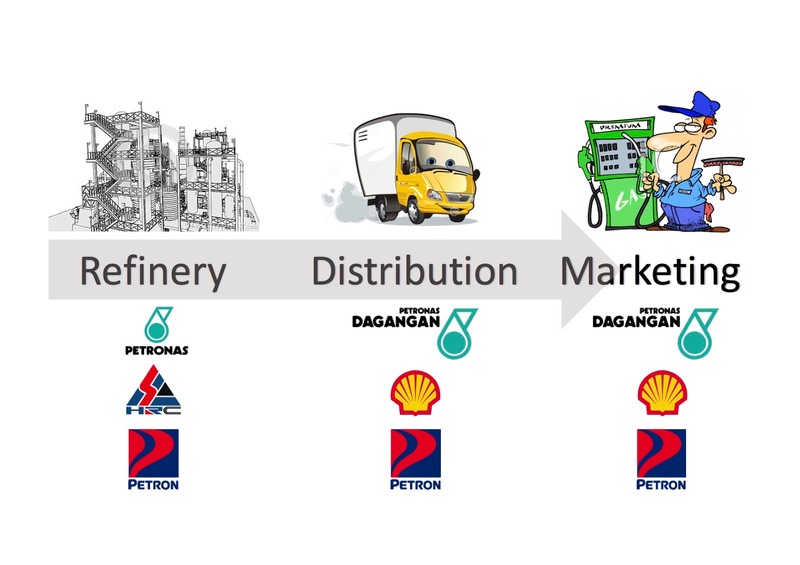 In this business, there are 5 players (in the order of size) - Petronas Dagangan, Shell, Petron, Caltex and BHP (under Boustead). It is also quite obvious that we can see they are sized up in such order. 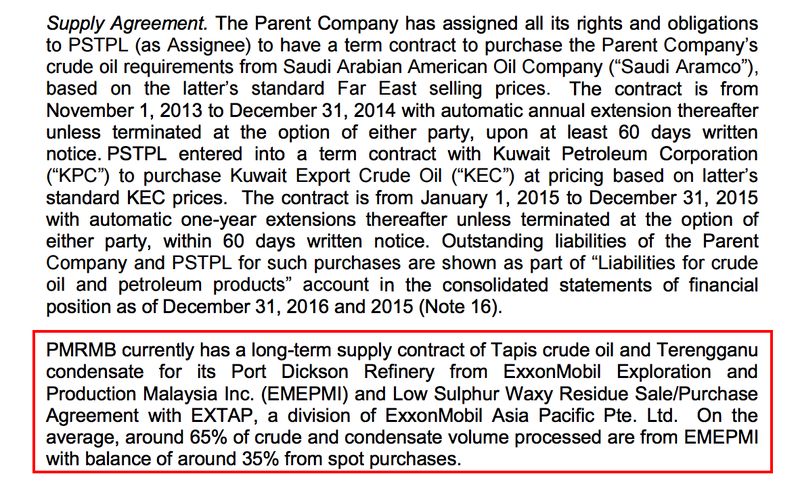 Petronas being the local player and supported by Petronas in terms of supply. Shell has been one of the largest and earliest player. It also had a refinery which can produce 156,000 barrels per day (bpd) - which was sold to Hengyuan. 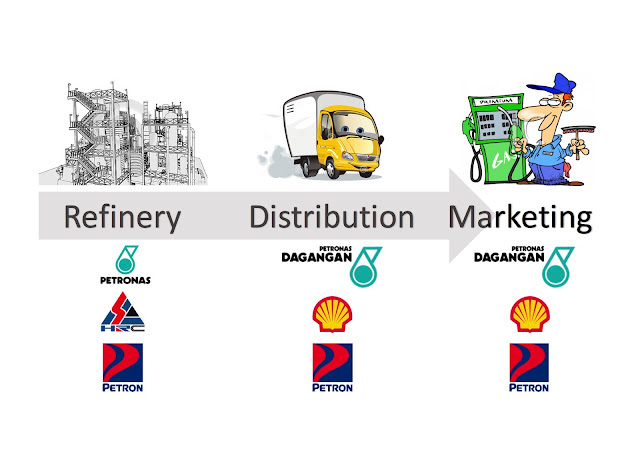 Petron exists from its acquisition of Exxon Mobil's (merger from the two) retail operations. Caltex is a unit of Chevron and understandably it gets its supply through import. BHP is a smaller unit owned by Boustead where it purchased from BP (British Petroleum). From above, it sounds like it is a crowded market. It is true that it is a crowded market especially if one does not have the supply and support. Hence, I believe that all the players have their own supply support. 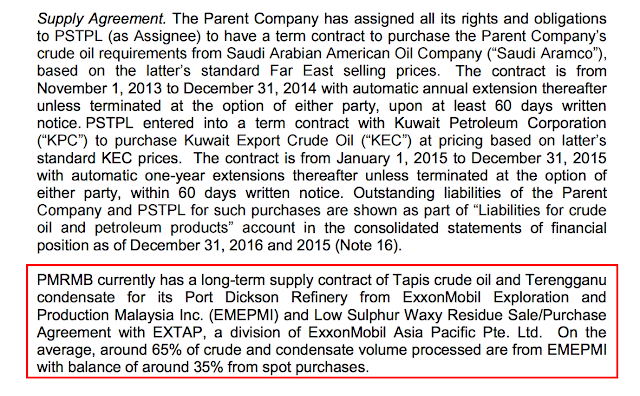 It is also known that Petron's supply comes from Exxon as highlighted below. Hengyuan bought the refinery which on paper can produce 156,000 bpd from Shell Refinery. In that exercise, Hengyuan took over a RM1 billion debt from Shell from that operation. In return, Shell which still operates more than 900 petrol station in Malaysia promises purchase contracts so that its supply is guaranteed. What Hengyuan now needs to do is to make sure that its petrol is Euro 4M compliant and it has to meet that deadline by next year. It is also a known fact that if the sale to Hengyuan did not materialise, Shell could have converted the refinery into a storage facility. That was a drastic business change and this could also mean that Shell was not willing to invest further in Malaysia. Having Hengyuan picking up and willing to invest have changed Shell's direction. It is now buying the refined oil from Hengyuan for its Malaysian operations. This also means that it trust the quality that Hengyuan's produces. I have also wondered what makes Shell not interested in the refinery but it will continue to operate the retailing business. Like Exxon, it could have also sold the Malaysian retailing arm - but understandably this is not the direction Shell's went for. That could mean that the IRR is not attractive enough for an oil giant such as Shell but good enough for Hengyuan, a smallish refinery back in China. At the same time as well, Chinese companies are busily acquiring assets overseas and they could have good support from their government. Although it looks like quite similar, the two exercises - Petron and Hengyuan - have vast differences in terms of post exercise strategy. Petron will need to obtain the trust from the final retail customer as the brand is not a name which we are familiar with. It needs to work on many things on the B2consumer front. On the other hand, Hengyuan needs to invest more on the refinery - getting good margins from the crack and sell to Shell at a predetermined price (MOPS). Needless to say Petron, while still needing to get its refinery efficient as well, will have the harder task. The reward however is more fulfilling as it "can control its own destiny" better. The more it gets consumer trusts, the better it will become. As the final price at the pump is now based on a certain formula - largely following MOPS, margin volatility could also be lower for Petron - as it is less dependent on the demand and supply of crude at any point of time as its produce is sold at the final pump price. Hengyuan on the other hand is like the furniture manufacturer for Ikea where Ikea controls the supply and demand. Raw wood will be supplied by Ikea - the furniture manufacturer will try to manage the costs - and later sell the manufactured furniture to Ikea back. I do not like this kind of position although one can also make good money. I like the position where one buys the raw crude from Exxon and I determine myself how one sells its finished products. Do I go aggressive by signing more commercial contracts and opening more stations or do I go slower. At the end of the day, if I sell the produce where my brand is carried that should worth more money. This is like if you are a Nestle and carry your branded products rather than being white labelling company providing processed chilli sauce for Maggi brand - which you think would be more valuable at the end of the day? Of course, to sell your own brand - it is a different strategy altogether. Hence, I do not think one should do an apple to apple comparison based on a similar PE. I've bought more than 10,000 shares after reading your articles. I'm so frustrated the price has gone up so fast but at the same time was happy that I managed to did some just in time. Can I ask have you bought any? It would be sorry to know if you've studied so hard but have lost the opportunity. Why you didn't put it inside your portfolio? Sorry, did not reply earlier. For Petron Malaysia, I did not put it inside my portfolio because whenever I wanted to purchase for the portfolio, it continued to go up way too fast. I usually do not chase after a stock unless the stock moves from a low base - like Airasia for example 2 years ago when it moved from 78 sen to RM1.12 in over about a week. For Petron it was moving from RM7.00 to RM7.80 and further up in a short span of time. In sharing this blog, I feel that I have a duty to not show myself as chasing after a stock as it is the wrong message to provide although a particular stock may still be undervalued in my opinion. A valuation to me is more for the longer term period rather than a short term period. One have to remember that the saying "Stock is a voting machine in the short term and weighing machine in the long term" as a principle for investment. I will seldom chase after stocks. I am not able to provide details on the new investment for the USD1.5 bio oil refinery as it is not finalised yet. It is not known, how it is going to fund raise for the new proposal if any.